Is Zen doodling on deadline defeating the purpose? 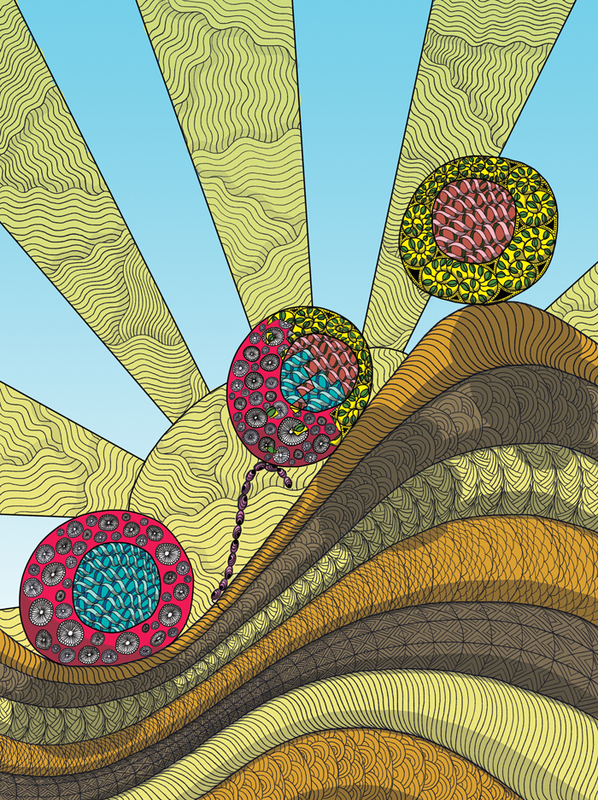 This illustration was done for a paper about paneth cells de-differentiating into stem cells. A sort of paradigm in stem cell research until recently was Waddington’s concept of the ‘epigenetic landscape’, which depicts cells rolling down a hill as they differentiate from stem cells to their terminal cell types. It was long believed until recently that cells could not reverse this process, or roll back up the hill. In the paper this image depicts, the authors demonstrate that activation of the Notch1 pathway directly or via irradiation induces Notch-dependent acquisition of a stem cell-like transcriptome. Like Sisyphus pushing his rock up the hill, Notch is seen here pushing the Paneth cell back up the ‘epigenetic landscape’ to a de-differentiated state with stem cell features. Taken together these results suggest that Notch may play an important role in the Sisyphean task of intestinal epithelial cell regeneration, particularly in cases of inflammation or injury. As my first attempt at Zen doodling I can tell you there was nothing Zen-like about it. But I learned a lot about making these and I would love to do more, with enough time. As an aside, the black and white version made great coloring pages for my kids. It occupied them for at least five minutes. No, I don't think they achieved "flow".